Internet Holiday Villas Asia Self catering holiday homes and vacation rental apartments direct from owners. Search HolidayVillas.Asia for dream holiday rentals, villas and apartments in Asia, Choose your location and book vacation rental direct with owner. Click on the locations below to to view holiday rental listings. Self Catering Holiday Villas, apartments and vacation rental homes in Asia. Asia is the world's largest and most highly populated continent. 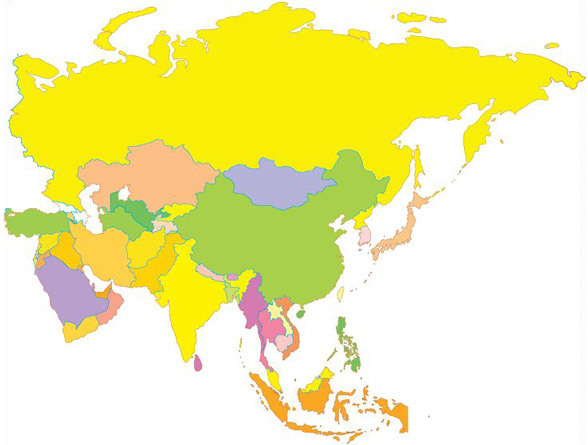 It comprises of 37 countries with a population of over 4 billion people or over 60% of the world's current population. It is bounded on the east by the Pacific Ocean, on the south by the Indian Ocean, and on the north by the Arctic Ocean. It offers a rich variety of Holiday accommodation rentals direct fom owners to explore the region. Asia comprises of 3 important political divisions from Turkey in West Asia that is considered to be part of both Europe and the Middle East (or West Asia) lying East of the Suez Canal in the south and East of the Ural Mountains and south of the the Caspian and Black Seas. South East Asia (or South Asia). From India, to areas south of China icluding Thailand, Indonesia, Bali, the Philippines, Malaysia and Singapore that all make exciting and interesting places to stay if looking for holiday villa rentals in Asia. Thailand holiday homes villas and self catering holiday rental accommodation in Thailand in South East Asia. Thailand is a magical country featuring Buddhist temples, exotic wildlife, tropical flora and beautiful sandy beaches and islands such as Koh Samui that has become a very popular destination for holiday villa rentals in Thailand. It has a fascinating history and unique Buddhist culture. Thai food is now renowned throughout the world. The people are friendly and epitomize Thailand as the ‘land of smiles’. Thailand offers a variety of great attractions and holiday rentals in Phuket and Koh Samui are much sougt after. The attractions of Thailand include diving sites, sandy beaches, hundreds of tropical islands, interesting and varied night-life, archaeological sites, museums, hill tribes, exceptional flora and bird life, palaces, and a huge number of World Heritage sites.